Speaker. Author. Women’s Walking Guru. Powerful Presentations that Move Women to Action. Helping women live happier, healthier, longer lives starting today. Walking saved my life during the darkest years I’ve ever experienced. My walks kept me healthy physically, mentally, and spiritually plus helped me to totally transform my life. I realized if walking could save my life then, it will absolutely create health for other women no matter their life-style or life-stage. I’m on a mission to share the transformational power of walking because women deserve an easy, efficient, highly effective way to care for themselves deeply and meaningfully every single day of their lives. I know from my own life-saving experience, walking is the way. The Alchemy of Walking: How and Why Walking Transformed My Life and How It Will Transform Yours Too. In this interactive, inspirational talk, Laura takes her audience on a deeply personal journey of revelation and transformation. 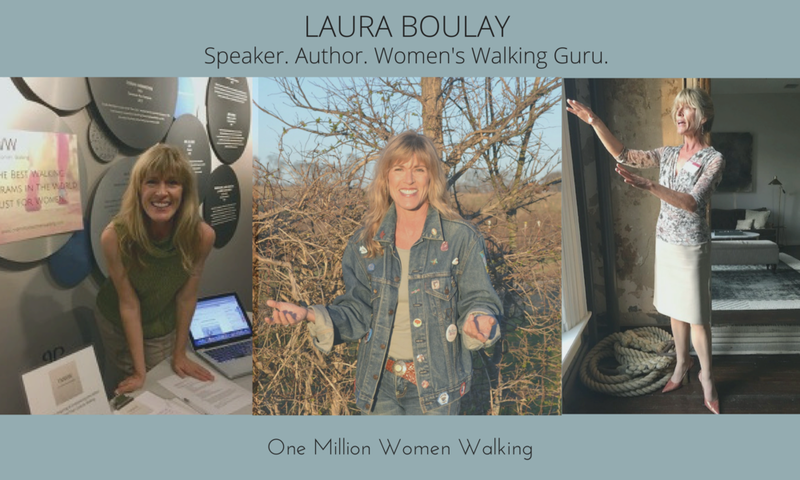 She shares her own life-saving experience with walking and shows how walking will transform your whole Self (body/mind/spirit) in just minutes per day. Learn why walking is the #1 doctor prescribed exercise. Discover walking breaks throughout the day are more effective than a hard daily workout. Get a wake-up call to start caring for themselves deeply and meaningfully—today! Learn 2 simple steps to start transforming their lives right now! This talk is for all the mompreneurs, fempreneurs, and female business owners who have said, “I want to workout but I don’t have the time!” In this high-energy, high-impact event, Laura shares how walking fits beautifully into your business day so that you not only get the workout you want and need; you lift your bottom and improve your company’s bottom line as well. Learn how walking increases creativity and helps with problem solving. Discover the hidden power of the “walk and talk” meeting. Realize walking is the ultimate multi-tasking miracle. Learn 2 simple steps to care for themselves and their businesses right now!